Buffalo Trace is one of the most prolific bourbon makers in America. In addition to their eponymous bourbon, Buffalo Trace makes a range that includes the impossible-to-find Pappy Van Winkle; the slightly more available Special Reserve; the cutting-edge-turned-classic Blanton’s Single Barrel; the highly sought-after Antique Collection, including George T Stagg; and great values like Eagle Rare and W.L. Weller, among others. One Buffalo Trace bourbon that I had missed over the years was Elmer T. Lee, at least until last week. (Credit goes to David “Doc” Diaz of Stogie Fresh for speaking highly of it during one of the bourbon conversations on my recent Cigar Safari.) At his urging, I picked up a bottle for the reasonable price of $30. The single barrel selection is named in honor of longtime Buffalo Trace head distiller Elmer T. Lee. And while the now retired Lee goes by the title “Master Distiller Emeritus,” he still personally selects the barrels that go into his 90-proof, single barrel bourbon. Elmer T. Lee, which comes in a classic-looking squat, square-ish bottle, pours a light copper color. The nose features a bit of oak with lots of sweetness including vanilla, rock candy, marshmallow, and tropical fruits. On the palate you find a soft, easy drinking combination of vanilla, honey, and dried fruit. The finish shows hints at some woody spice but quickly tapers off, leaving you wanting more. And that’s what I enjoy about this bourbon. It’s an easy sipper that’s balanced and rich. You’ll want to look for similar qualities in a cigar pairing. Herrera Estelí, PG Gourmet Series, La Aurora 107, L’Atelier, and Illusione Epernay are some of the cigars that fit the bill. As for Elmer T. Lee, this seems like a definite addition to my permanent rotation. It’s 95% of the richness of Blanton’s at just 60% of the price, and certainly worthy of drinking straight. 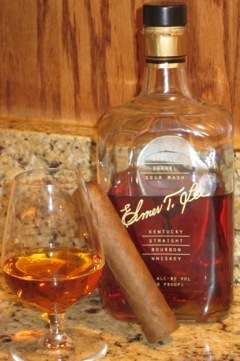 If you like bourbon but haven’t made a point of trying Elmer T. Lee, it’s highly advised that you pick some up. I’m certainly glad I did. Good bourbon at great price. Nice review. It's a fantastic place to visit for sure…everyone should go there soon! The Trace that is…gotta' look for this one…still remember being in the bottling room and putting my head down in a vat that just had a barrel of Blantons dumped in it! Ancient Ancient Age is made from the same one as Blanton's. Mashbill is only one of many factors that make each bourbon what it is.